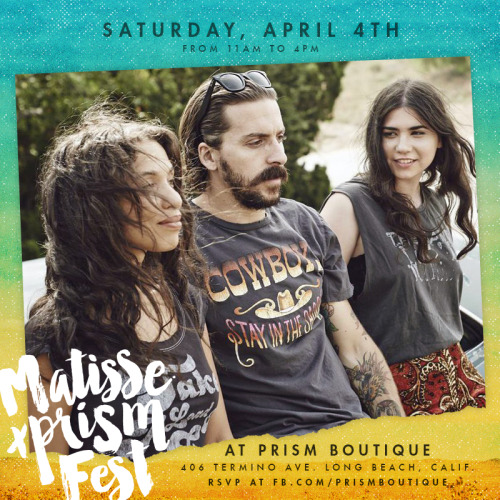 Because the perfect outfit is just as crucial as a legit lineup - Kick off festival season with Matisse & Prism Boutique! Join us Saturday, April 4th from 11am to 4pm and get festival-ready with some of our favorite local brands. The lineup: MATISSE FOOTWEAR with the coolest sandals and kicks, plus their brand new collab with Kate Bosworth. Midnight Rider with the perfect graphic and rock n’ roll tees, Pamela V. with handmade bags and accessories made from vintage Peruvian leather and fabrics. Sun Bum with sun care accessories for those who live and love in the sun. Meet and hang with the local designers, get styled from head to toe with our favorite bloggers and our very own boho braid bar. Plus, enjoy homemade tacos, desserts from Hannah’s Bananas., tasty drinks, and DJs all day long.